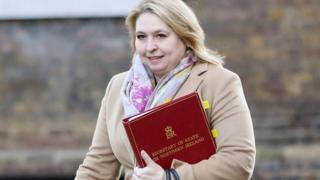 Karen Bradley has been accused of “fiddling while Rome burns” for seeking further public appointment powers in the absence of a Stormont executive. The secretary of state has put regulations before Parliament that would allow her to make appointments – including NI’s Attorney General. John Larkin’s contract is due to expire on 23 May 2019. The NIO said restoring devolution remains an “absolute priority” for Mrs Bradley. But Felicity Huston, Northern Ireland’s former Commissioner for Public Appointments, said Mrs Bradley had a “moral and constitutional duty to start running the country”. “It will be seen as a bit of fiddling while Rome burns,” she told BBC News NI. “A few decisions about a few public appointments is not what people need: they need serious stuff or an assembly back. Under devolution, the power to appoint the Attorney General is held by the first and deputy first ministers. But the Stormont executive collapsed two years ago, due to a row over a flawed renewable energy scheme. The political deadlock means many decisions have been left in departmental in-trays, until such times as devolution is restored. Last year, the secretary of state passed a law through the Commons that gave UK government ministers the power to make some public appointments to the NI Policing Board, the Probation Board and the Police Ombudsman. More appointments regulations have been placed before Parliament that are likely to be approved this month. They will allow Mrs Bradley to re-appoint the Attorney General position, the Children and Young People’s Commissioner, as well as members of the Victims and Survivors Commission and the Livestock and Meat Commission. While the secretary of state has moved to take some appointment powers, there are a wide range of issues that she has said remain matters for devolved government. They include implementing significant health reform through the Bengoa report, and a compensation scheme for victims of Historical Institutional Abuse (HIA).